I am quite honestly a little frustrated with some of my fellow Americans. 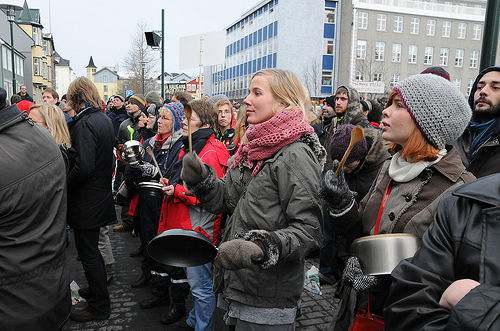 I have been studying various plans for "taking our country back" and a lot of these revolutionary groups seem to be using the little publicized "Icelandic Revolution" as a template for their surefire way of restoring the republic. A wise man once said something like those who fail to understand history are doomed to repeat it. I feel like I live in a society of sheep that understand nothing about human psychology. You don't ask for freedom. You don't beg for freedom. You don't plead with your oppressors to start treating you and your family fairly. If you want something in this world, and it is rightfully yours, you take it. But it seems like we keep doing the same thing over and over and expect different results. In my opinion it's not going to happen. We may never know the full story of the Icelandic Revolution because there has been so little coverage of it in America or, for that matter, anywhere outside of Iceland. To read some of the articles on various blogs they would have you believe that a bunch of people threatened their government with kitchen ware and the government yielded. That's not quite what happened from my understanding, but I can understand why some might think that. For anyone who has ever been hit with a frying pan, I suppose they might be sympathetic to this claim. Unfortunately the reason they believe that is because the frying pan did a little extra damage to the part of the brain that controls their sense of rational thought. Some people seem to think that all we have to do is get 100,000 people to show up on The White House Lawn and tell Obama that he is fired. They won't need any guns. They simply think that if less than 1% of the population shows up to tell Obama he is fired, it will force him to resign. Actually from what I can tell, the plan is to remove all 535 of them (including our lawmakers) and replace them with people who have massive head trauma due to frying pan incidents in the past. What kind of world do we live in? I mean…come on. Wake up people! Around 100,000 Texans signed a secession petition that got laughed at. In truth 100,000 people is nothing compared to the 24-25 million people that live there! So why would an unarmed band of 100,000 rogues, out of a population of 300 million, make a difference? Is it simply because they showed up in person? I have no doubt that the situation would be taken seriously but it would not likely get the desired result. Do we not remember recent history? I've got a big clue for you… If literally hundreds of thousands of people nationwide, who were primarily liberal-minded, got no results with a progressively minded government, then why would you think that the leftists would listen to 100,000 fanatic right-wingers? They didn't listen to their own constituents. Why would they listen to you? Here's a reminder. It hasn't been that long. Try to access your long-term memory. I understand that a cast iron skillet across the noggin has done some damage so maybe this video will help. This didn't just happen in New York. It happened all over the country. The news media barely covered it (much like the successful revolution in Iceland) and it went nowhere. Things have not changed. No one listened to or met any demands that were made of the Occupy protestors. For the love of all that is good, we had a group called "Occupy Joplin" in this area. Joplin is a town of less than 60,000 people. This movement was huge, but it went nowhere. There are a few things that people don't look at when they compare our situation to the situation of Iceland. First of all, Iceland went bankrupt. Their whole financial system collapsed. If we compare it to our most recent financial collapse, when the housing bubble burst, we are comparing apples to oranges. It is not that bad here yet. You have to understand that over 90% of the people in Iceland wanted answers. They were united. There was tremendous pressure on their leaders to succumb. We live in a country where we continue to re-elect those that have done us wrong, and we reward them with another term. Another thing that people fail to realize is that Iceland and The United States are two vastly different societies. America is a nation that is quick to send a military response at the drop of a hat. Iceland is not that same type of society. When was the last time you heard of Iceland threatening anyone with military force? The United States will occupy countries if our leadership deems it necessary and we are still the most powerful military in the world. If you want to argue that with me then you would have to agree that we are at least near the top of the list. The United States is a country that believes that war brings peace. It trickles from Washington D.C. all the way down to those God-Fearing, Gun-Toting, Constitution-Loving Patriots that I am proud to call my family. So why in the world would anyone think that peaceful assembly is going to overthrow a government in America? I am still scratching my head on that one. You can't ask these people to respect you out of the goodness of their hearts. Their hearts are a little on the "dark side" and they do what most of us do…they watch out for themselves and their families. Oh no, make no mistake, this is America. In America you get respect in only one way, by demanding it and using leverage to back up your demands. Do you think that the Icelandic Revolution could have been pulled off in Russia or China? Do you remember this guy? It's been nearly 24 years since this guy stood against a row of ranks in Tiananmen Square. Nearly 24 years later we still don't know his name. 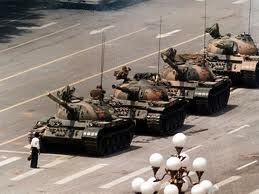 He is known around the world as "tank man." I've read reports that he is in prison and I have read reports that he was executed but no one knows for sure. There are no credible sources that I can cite for you. Either way, this guy had a lot of courage but not too much in the way of common sense. If you can find him I am sure he'd lead your peaceful march on the Capitol. The truth of the matter is that this guy wasn't going to get any respect from these tanks unless he was driving his own tank. That's how it works. I don't write the rules. I don't always like the rules. That's reality. So will pots and pans work in America? Oh for sure. Rumor has it that DHS hollow points can't pierce a well-made set of kitchen ware. I can't make this particular march my friends but you guys go ahead and I will catch up with you on the next one. I'd go but we get our kitchen ware at Wal-Mart. It is made overseas and it's not the good stuff. If we have a total financial collapse then we should all march on Washington D.C. with nothing but can openers and pizza cutters. That would be my suggestion. We do it a little differently in this country. We have our own style. That's just how we roll. My goal is to wake people up. There is nothing wrong with having a good heart, but we must focus on things that can work. My late Mother was a Saint if there ever was one. But she was also the type of person who would believe in these plans that are doomed for failure. Mom, if you are reading this from Heaven I love you and miss you dearly, but I have to tell you something. There was a beer commercial that came out years ago. A cow was riding a surf board in the commercial. You asked me how they got her to do that. I told you, "I don't know Mom." Mom, all of these years later I have to tell you something. It wasn't a real cow. I told you I didn't know to spare your feelings. I love you and I look forward to the day when we will be together again. Please tell Dad I said hello. I love my Mom and do miss her but that is a true story. She thought it was a real cow hanging hooves at North Shore. I wish I could find a copy of that old commercial. My Mom would have also believed that this country could be saved now by peaceful protests. She would believe that they would listen to reason now after all of these years of slowly taking away our freedoms. She would believe that the people could make that happen. I gained some of my cynicism from watching my Dear Mother. I watched her bend over backwards and believe in the goodness of people and constantly be let down. The balance may lie somewhere in the middle, but I refuse to be that naïve. I don't believe for a minute that these plans can work. If you want to peacefully protest to force change, you are probably in the wrong country. In this country there is only one thing that really gains respect and attention and we all know what I am talking about. Yet no one really wants to talk about it.